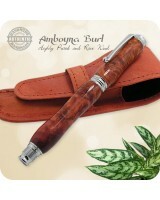 The warm feel of a natural wood fountain pen is truly something to be experienced and enjoyed. 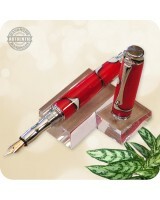 Handmade fountain pens make very impressive gifts that are not easily forgotten! There is no better 'Thinking of You' gift than the one held in your hand every day! 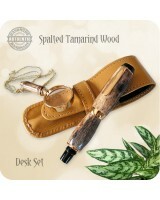 Quality handcrafted from exotic and domestic burl woods, antler horn, tru-stone, dazzling acrylics, m3 metals and more. Great for birthday, graduation, mothers day, fathers day, retirement, anniversary gift giving! This is Nature's Artwork! 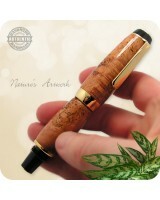 How can a wood pen be this gorgeously luxurious? Handmade Fountain P.. 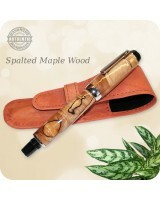 This luxurious handmade Fountain Pen was quality handcrafted on the wood-lathe from a gorgeous pie.. This truly is a pen fit for the President! Plain and bold without the bling, the El Presidente Pen.. 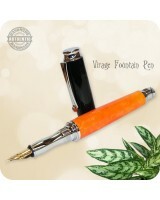 This genuinely handmade Virage Fountain or Rollerball Pen has been handcrafted from sections of Bu.. Custom crafted according to your wishes! 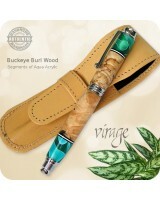 This Virage Fountain Pen to be handcrafted on the wood-la.. This genuinely handmade Virage Fountain Pen has been handcrafted from highly prized and sought aft.. 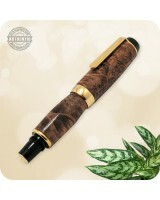 This beautiful Virage Fountain Pen has been handcrafted in the very popular Black and Crushed Oran..